This class is designed for nutrition professionals, functional medicine clinicians, naturopathic physicians, and other integrative medical and health practitioners (MDs, DOs, nurses/nurse practitioners, chiropractors, acupuncturists, etc.). This is an in-depth, science-based course, and a working familiarity with the basics of human nutrition and physiology (especially digestive and immune physiology) is assumed. The Microbiome Mastery Essentials (MME) course is the most comprehensive course available for practitioners who want to learn the most relevant concepts and information about the microbiome so that microbiome-based approaches can be incorporated effectively into practice. The MME course includes over 18 hours of video content organized into four modules. 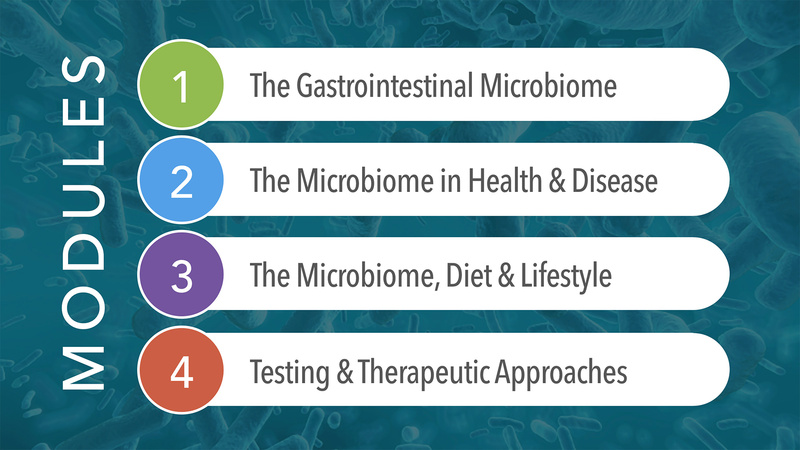 The content covered in the MME course reflects the latest microbiome research and clinical insights, and recent scientific studies are cited throughout the course. Brief descriptions of each module are included below. Learn about the different types of microbes that inhabit gut communities, including the most important microbes and the critical functions that they perform. We cover important beneficial and harmful microbes, and how they interact in complex communities in ways that can have important impacts on human health. The microbiome interacts extensively with our physiology, including the digestive, immune, nervous, and endocrine systems, as well as extensive interactions with cell metabolism. These interactions between our microbiome and our physiology are bi-directional, so this module focuses both on the impacts of the microbiome on our physiology, as well as the physiological functions that help to manage and influence the microbiome. We will also cover how these interactions often become imbalanced in chronic disease. Diet and lifestyle factors influence our health in large part due to their effects on the microbiome. In this module, you will learn how different dietary components, nutritional regimens, supplements, stress, sleep and circadian rhythms all affect the microbiome in ways that have positive, or negative, impacts on health. Microbiome testing can provide very useful insights into health conditions. We will cover the various functional tests that are currently available for assessing microbiome imbalances and related physiological functions, including direct-to-consumer tests such as uBiome, and clinical tests such as GI-MAP. A primary focus of this module is on learning how to recognize common dysbiosis patterns – and most importantly – what can be done therapeutically to re-establish a healthy, balanced microbiome. The course content consists of over 18 hours of video content (slide presentations with voiceover), organized into four modules. Videos can be viewed online any time after each module is released. Audio files will also be available. There is no set timeframe for completion of the course, so you can proceed at your own pace. All slide presentations will be available as downloadable PDF files. This is a private Facebook community that is available exclusively for practitioners who have registered for one or more Microbiome Mastery courses. This community is a great way to interact with other program participants and with the course instructor, Tom Fabian, PhD, as well as receive updates on the latest, and most relevant, microbiome research and clinical information. You will have the option to take a final 50-question, multiple-choice quiz in order to qualify for a Certificate of Completion. Certificates will be awarded to based on scoring at least 70 points out of a total of 100 points on the quiz. Tom is a functional nutrition practitioner, educator, speaker, and clinical laboratory consultant. He is a former biomedical research scientist with expertise in the role of the microbiome in health, disease and aging. He develops online educational programs for practitioners seeking in-depth education in the microbiome and related topics. He also has extensive experience in the areas of aging and healthspan optimization, both through his previous research experience as well as his more recent experience as a functional health practitioner. 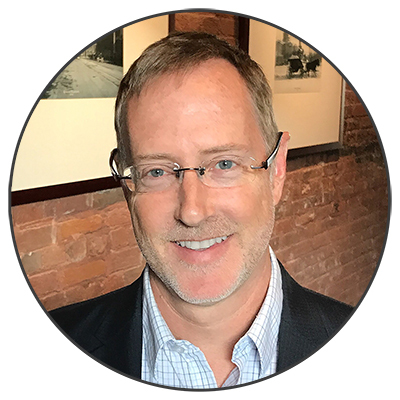 Tom has worked with a variety of clinical and direct-to-consumer testing companies that offer microbiome, pathogen, gut, and immune testing. He currently serves as a consultant for Diagnostic Solutions Laboratory (a clinical testing company best known for the GI-MAP gut test), and has previously worked as a consultant with Viome (a direct-to-consumer microbiome testing company) and Vibrant America Clinical Lab. Not sure if this program is right for you? Contact Tom by email or phone to get your questions answered.